After a month since it was released in the big screen and more than $1 billion and counting in terms of sales, here's more about Avengers. It is quite rare for a movie with an all-star cast to become successful. Most often, all star cast movies disappoint moviegoers and end up as box office bombs. There are exceptions though like the Ocean series of George Clooney and add The Avengers in this rare list of successful all-star cast movies. One of the reasons cited for all-star cast flicks failures is balance of scenes among the characters and the ego driven stars on the movie. This issue is enough to create a disaster when making an all–star cast film. 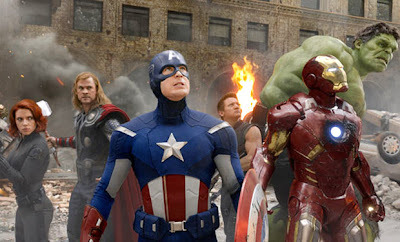 The Avengers is one of the most highly anticipated movies not because it is an all-star cast movie but it is an all-superhero movie based on the Marvel comic strip series. Luckily, Josh Whedon pulls off the movie with great success. One thing that you notice in The Avengers is that it does not have any pretensions at all. Whedon did not have the intention of making a superhero movie but rather, he created a superhero movie with more human qualities. If not for the costumes, you would think that this is actually a movie about friendship alone. In The Avengers, movie goers can easily identify themselves with every characters assembled. It is like seeing a group of friends converge in a dormitory and see how each one of them have issues and concerns with one another. Another interesting point in the The Avengers is that one liners uttered by each characters are really real and not the usual kilometric monologues espousing their advocacy of protecting the planet and the victims. This is what makes the movie endearing among moviegoers. Iron Man, Hulk, Captain America, Thor, and the rest of the characters were delivering lines that can be heard in normal circumstances. Who would have thought that in this movie, Hulk and Thor would battle over a simple issue of strength and bragging rights? The one-liners are really funny, they do not require you to ponder and look for any other meaning other than the obvious message. The lines are just simply in your face remarks. It is a good thing that Whedon webbed a story, thereby, creating a moment for every character. Each Marvel superhero fan will not be disappointed as each character have their own one liners and of course, action scenes. While some moviegoers will complain that it has more speaking moments rather than action scenes, but when Whedon created the action moments, fans will surely be blown away with scenes beautifully created and choreographed. Yes, it still is about the end of the world misery conflict but Whedon weaved it with more sanity compared with the Independence Day final moment. It has no virus to speak of. It characterized pure strength, vigor, and vitality in every character. After seeing this movie, you will surely exclaim that who needs Transformers, who needs Michael Bay, and who needs Justice League of America? Expect more franchise editions from The Avengers in the coming years, and hope Whedon will still helm future editions of this film.